After 12 issues, Marv Wolfman’s latest installment on a character he created four decades ago ends not with an all-out final battle against evil, but a simple outwitting of the enemy. On one hand, it’s a little disappointing and anti-climactic; on the other, it’s refreshingly simple while maintaining the integrity of the character. 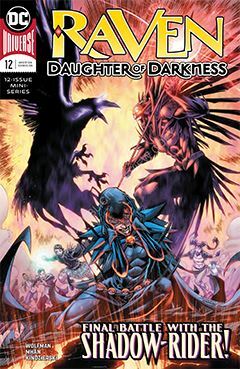 It’s in this issue that we begin to see less of Raven and more of the Daughter of Darkness, as her demonic side begins to emerge amidst the turmoil of her battle with the Shadow-Riders. She begins to emerge as a leader among the Arcanes of the DC Universe; or, if not a leader, at least a power to be reckoned with. As for her unwilling association with Baron Winters, that’s yet to be resolved. Will she ally herself with him, to battle the chaotic magics of the DCU? Will the current incarnation of Night Force ever form again? I’m sure that all depends on reader response. I can’t help but feel there was a sequence left out, which would have addressed these questions. It was a good series while it lasted. Throughout, we have seen Pop Mhan’s artwork develop and mature, though there’s still some growing to be done. Back in the 1970s and ‘80s, there were artists like Don Heck and Alex Saviuk who weren’t necessarily fan favorites, but they hit their deadlines. Hardly rock stars, but vital to the craft. Pop Mahn may be such an artist, and that’s not a bad thing.